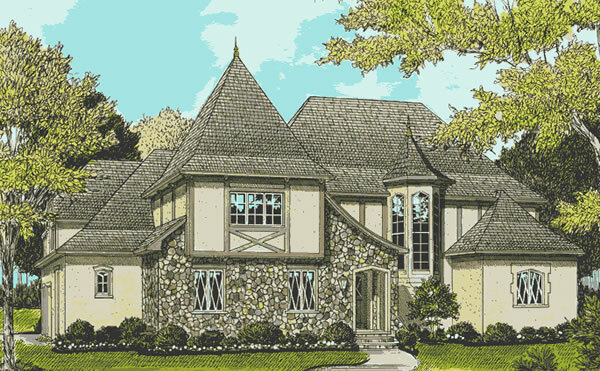 This home has a number of European influences, from the Tudor detailing and decorative windows, to the curved rooftop and cupola roof. The stonework on the front facade combines beautifully with the stucco finish, and the wood trim and details. A two–story foyer space greets you after walking up the curved entry steps. To the right is an open stairwell, to the left is a formal dining room, and straight ahead is the galleria. Beyond the galleria is an open great room with a ceiling that has exposed beams and a height of 11'–4", a fireplace flanked by built–ins, and glazed doors that walk out to the covered terrace at the rear. The great room is open to the kitchen, which has a two–story high ceiling, a center island with a sink, and a sun–filled breakfast area that looks out and walks out to the rear. Next to the kitchen is a hallway that leads to a walk–in pantry, a full bath, a study/guest suite with its own private access to the full bath, a side porch, a laundry room, and a three–car garage. The master suite is located on the other side of the galleria. The master bedroom has a wall of windows that look out to the rear, and a door that accesses the covered terrace. The master bath features a tub and a separate shower, two separate vanity sinks, a private toilet room, and a large walk–in closet with a 'her' and a 'his' side. The stairwell leading to the upper floor features angled walls with full height windows, providing views and lots of natural light. After reaching the upper floor, a door to the right opens into a bedroom suite, which has an 11' ceiling and has access to a full bath. The balcony looks down to the foyer and galleria spaces below, and a pair of doors leads to an open game room. The game room has a vaulted ceiling, windows that look out to the rear, a wet bar, a closet, and a door to the full bath. As you continue down the balcony, a railing on the other side looks down to the kitchen space. Two more bedroom suites are located in this wing, each with its own private full bath. The balcony wraps around to a media room at the rear, which is located over the garage. 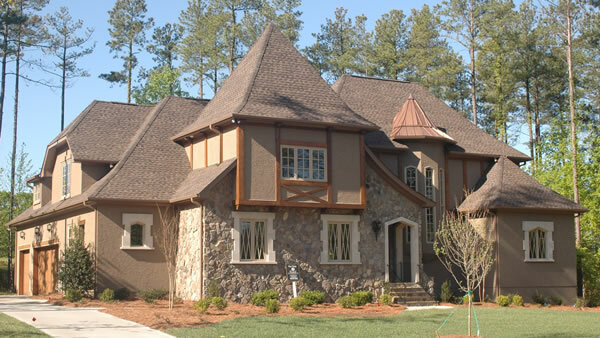 This beautiful home has a classic European look, employing steeply–pitched front and rear facing rooflines, multi–paned windows, Tudor–style wood details, and a cupola atop a projecting element filled with windows. The foyer and the kitchen feature two–story tall ceilings, and the great room has an 11'4" ceiling, while the rest of the spaces on the main level enjoy 10' ceilings. The master suite occupies the entire right side of the main level, and there's a guest room that could be used as a study or an office that's next to the formal dining room. There's a sunny nook off the kitchen, and a covered terrace off the great room. The upper level has three bedroom suites, a media room, and a large game room.